As I read the seventeen poems in Harry Moore’s chapbook, What He Would Call Them, I thought almost immediately of Auden’s oft-quoted pronouncement: “Art is our chief means of breaking bread with the dead.” With a clear understanding of the importance of family relationships across generations, Moore celebrates his forebears in most of the poems in this collection. But things do not stop there. 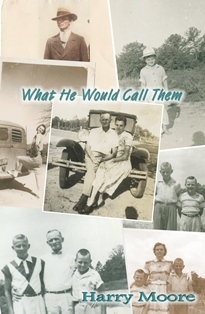 He brings his readers forcibly back to the present, connecting his current life with previous lives, his own and those of his parents and grandparents. as if to dare the world. This photograph, demonstrating as much vitality as he implies, adorns the book’s cover. Lastly, there is his grandmother, a housewife who with “mouth set and jaw firm, like a post oak” goes about her tasks. The naming of things, associated with Moore’s father, is a primary theme in the collection. For the poet, to call things in the natural world by their proper names and to understand their essential nature is to connect with his past, even in the present world when such knowledge does not appear to be so essential. In fact, Moore states in one poem that the names of flora and fauna he learned from his father “are of no use to me.” But he surely means they are of no use to him in a practical sense. They mean everything in defining who he is, and the joy and consolation at such naming jumps out from every page. He impressively fulfills what Conrad called the chief duty of the writer: the accurate naming of the things of God. A similar juxtaposition of the past and the present gives Moore’s poems great poignancy. In verse artistically rich and highly readable, Moore has accomplished more than many authors manage in much more space. Both the insight and the felicity he demonstrates will, I think, draw many readers to this volume. Norman McMillan is author of the memoir, Distant Son: An Alabama Boyhood, and of two plays, Truman Capote: Against a Copper Sky and Ashes of Roses, based on stories of Mary Ward Brown.